You all asked for some new Fall dinner recipes a couple weeks ago – crock pot meals, soups, and casseroles – and I listened!! Here is the first FALL dinner recipe I am bringing y’all: Crock Pot Balsamic Roast Beef. What I really like about this meal is that it ended up being an economic meal choice, even though I didn’t think so at the grocery store. We spent just under $20 for a 3.4 lb roast beef. At first, I was a little anxious about it because that is more than I would normally want to spend for the 2 of us. However, we ended up getting 3.5 meals out of this recipe. The first time, we served it up with Mashed Sweet Potatoes and a salad. The next couple of times, we reheated the meat in the microwave with slices of pepper jack cheese and put it on rolls for a sandwich. I’ll be honest: I think I liked the sandwiches better than the original meal. The Balsamic Roast Beef just had fabulous flavors as left overs and paired so well with the subtle kick of the pepper jack cheese. We will be making this recipe again when the schedule is busy. It was great to be able to just throw it in the crock pot the first time around, but it was even better to have a couple other easy meals sitting in the fridge, too. A definite make again easy dinner recipe! Place roast beef into your crock pot. In a bowl or measuring cup, mix together all remaining ingredients. Pour over roast beef and set the timer for your slow cooker. Cook on high for 4-5 hours or on low for 6-8 hours. I personally cooked on low for 6 hours and cooked on high for the last hour, rotating the roast beef every 15 minutes to make sure every side soaked in the gravy at the end. If you are at home while it is cooking, feel free to turn the roast beef half way through the day. Once the roast beef is done cooking, remove carefully with tongs. The roast beef should break apart easily with two forks. If you want a stronger taste, ladle about ¼ - ½ cup of the juice/gravy over roast beef. Do you take enough time to enjoy life? Great dish for the weekend! Love putting crock pot recipes together that can feed everyone whenever they want to eat. Weekends are busy! This looks absolutely delicious, Maggie! My family would love it and I love that it’s made in the slow cooker. Can’t wait to try this out! My husband would totally love me forever if I made him this…. Pinning! I love anything that requires my crock pot! This is perfect for fall. I am always looking for a new crock pot recipe! Thanks! I’m ready for lunch now. This looks great. Pinning. 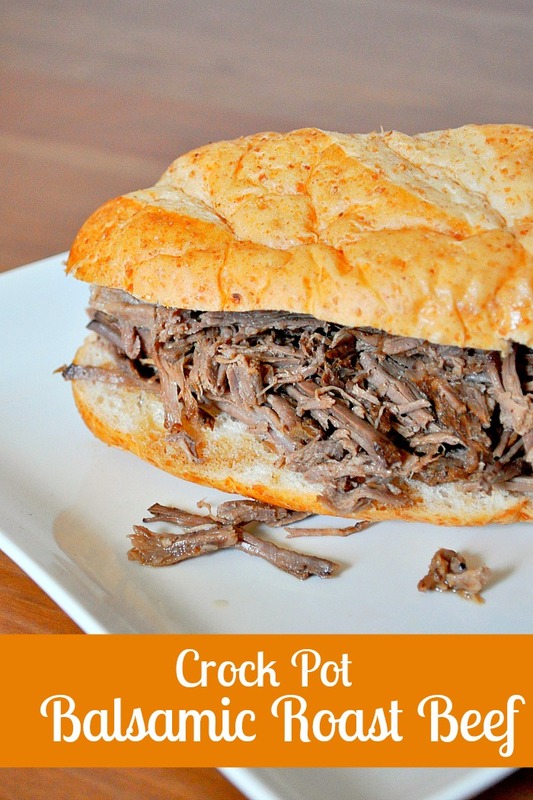 We were just saying the other day that we need to make more crockpot recipes, this looks delish! My family loves roast, but I always fix it the same way. I can’t wait to try this. I love balsamic recipes, and this looks so good. Oh my gosh, this looks amazing! Will have to try this soon! 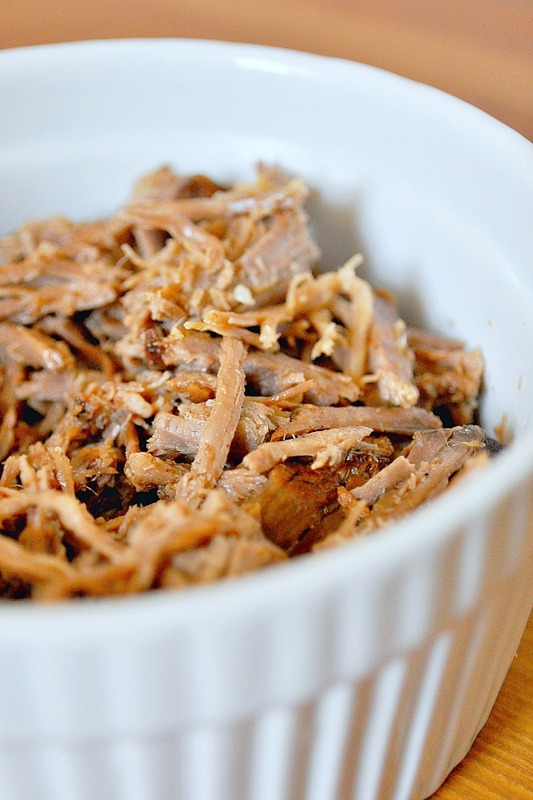 Always looking for crockpot recipes, pinning! Yum! Crockpot and balsamic…this is definitely one I would like to try! I am addicted to balsamic…I have an entire cabinet filled with different flavors of balsamic. I have issues, I know. LOL This really looks delicious! Yummmm, yes please 2 of those. I’m really hungry right now! This makes me hungry! Love this! Looks super yummy and moist, will have to try! YUM! that looks so good. The balsamic sounds so good. love that its a slow cooker recipe too! That looks like some amazing roast beef! My husband would simply adore this! It looks great! Thanks for the recipe! Thanks, Shauna! This was definitely warm and tasty on a cool night! It’s been so chilly here lately. What a wonderful looking roast beef sandwich!! I love how roast beef shreds after being in the crock pot all day!! this recipe is a keeper!! Pinned!! Thanks, Michaela! 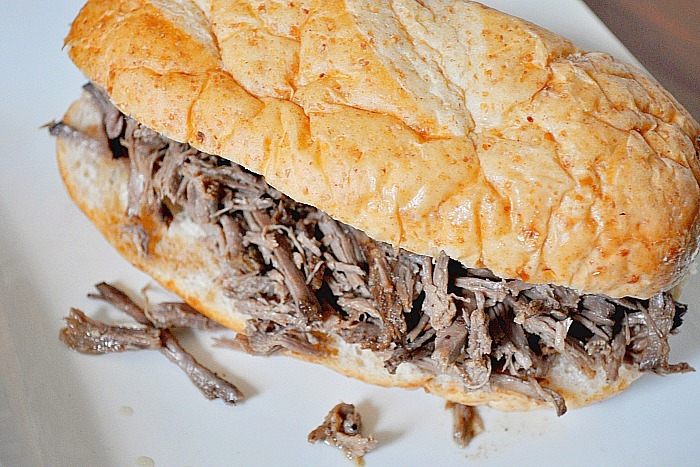 I absolutely love roast beef sandwiches and this was such an easy way to throw them together! I love a great slow cooker meal! This looks delicious! I don’t know what I would do without my slow cooker!! I use it so often. Oh! Yum this looks delicious. 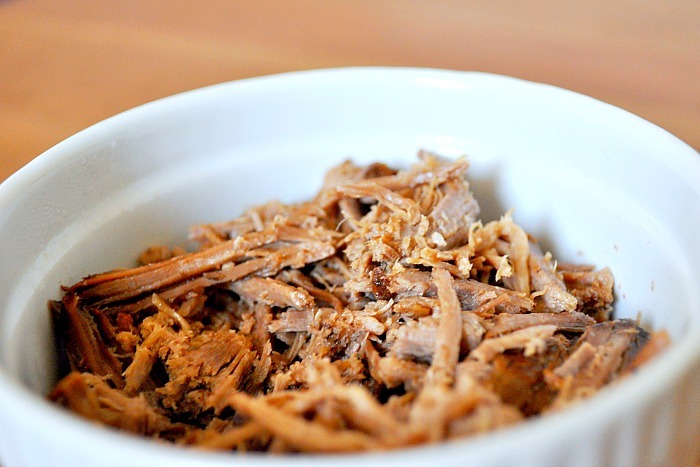 I love using my crock pot and this recipe will be on my to make list. Thanks for sharing and I will be pinning this. Thanks, Marlys! I hope you like it. It was definitely easy to put together.